Do you know of patients suffering from breast cancer? Do you want to help patients in your own little way? Do you want to express your support in breast cancer awareness without having to attend campaigns and information drives? Regardless of age and race, you can now do your part in fighting this deadly killer by buying breast cancer products. Breast cancer is one of the hardest and most expensive forms of cancer to treat and cure. Patients have to set aside a huge amount of money just to cover expenses for treatments and medications. Sometimes, they need to undergo major surgical operations like mastectomy that costs them a fortune. Sadly, not all breast cancer patients can afford to get themselves treated. In third world countries, most women die of breast cancer because they don’t have enough money to spend for treatments. With this in mind, many charitable institutions come up with ways to raise funds for less fortunate patients. Aside from asking donations, they team up with manufacturers to create a line of breast cancer products. Every time you buy any of these breast cancer products, a certain amount or percentage goes to foundations or charities that provide financial support to breast cancer patients. Breast cancer products are available worldwide. You can buy them in leading supermarkets and department stores. 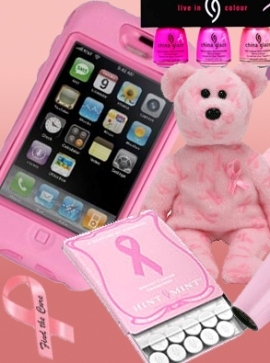 With the advent of technology, you can even do your shopping for breast cancer products online. There are many items to choose from and they’re all very affordable. Cell phone accessories: Cell phone charms and antenna rings are very in demand since almost everybody owns a phone nowadays. They are available in different colors, length, and sizes. Some come with beads and stones while there are those of plain designs. Jewelry: Breast cancer products like bracelets, necklaces, and rings are very popular. They are ideal gifts to your girlfriends, mom, or sis. Pink is the most dominant color of gems used in these products but you can have yours custom made to include other colors as well. Apparel: T-shirts, wrist bands, head wraps, pants, shorts, sweaters, and socks are must-have breast cancer products. You can wear them anytime, anywhere. They are also available in different sizes. The t-shirts in particular are bestsellers since they’re very cute with printed sayings on breast cancer. Beauty essentials: You can also buy towels, robes, and even nail files. Some stores sell soaps, lotions, shampoos and conditioners, and even perfumes made by manufacturers which are advocates of breast cancer. School and office supplies: You can buy breast cancer products which you can use whether you’re at the office or at school. These products include memo pads, notebooks, journals, pens, pencils, and many more. There are even breast cancer-themed scrapbooking materials available. Kitchen needs: Manufacturers also come up with breast cancer products you can use in the kitchen. These include cookie cutters, pot holders, aprons, spatula, and many more.